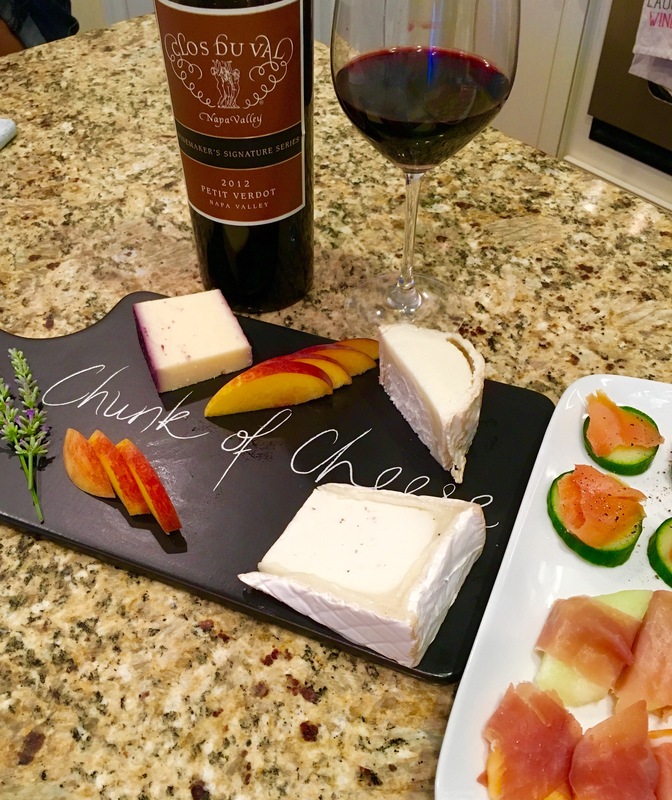 Wednesday Wine and Cheese – Eat, Drink, and Go! Wine and cheese is one of my favorite things. It’s not a traditional meal, but with the accompaniments, it does the job. If I ever were to turn it down, please take me to the hospital cause something is wrong with me. 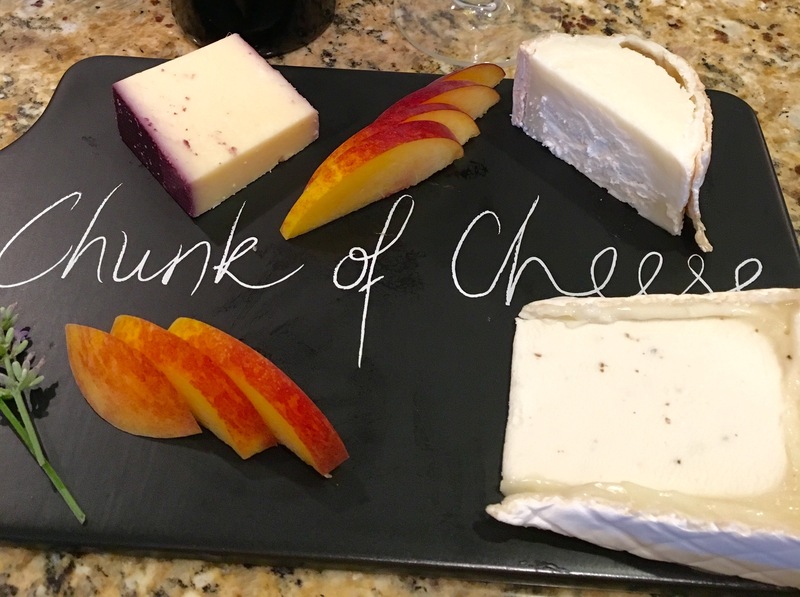 The pairings of cheeses is always exciting – I generally like to go with three on a cheese board. And something on the side, for example prosciutto wrapped melon and smoked salmon on cucumber slices. Three cheeses that are different enough from each other, but all delicious in their own right is the best set up. Last night, the three we selected included two trusty faves and one new one (new to me anyways). Bucheron is a fantastic French cheese, I can best describe it as a double treat – soft goat cheese in the middle surrounded by a ring of Brie-like bliss. And the new one for me – a sharp Wisconsin cheddar that was soaked in red wine. This one was deliciously crystiline but still melted in your mouth. But the winner of cheese perfection last night was Cypress Grove’s Truffle Tremor. It is the truffle-est cheese I’ve ever had. And I’ve tried a lot of truffle-flavored cheeses (see blogs about the Fancy Food Show in NYC). Like the bucheron, it too is enveloped in a Brie-like ring of softness. If you like truffle flavor and you like goat cheese, you have to try this cheese because you will absolutely love it. I literally screamed out “truffle tremor” when I saw that my Wegmans was finally carrying it the other day. My husband tried to pretend like he didn’t know me. Understood, it might seem odd to some bystanders to see someone get so excited about a cheese. But if you’ve tried this one, you know I’m not crazy. So the wine soaked cheddar is on the left, the bucheron is on the top right, and the truffle tremor (look at those flecks of truffle!!!) is on the bottom right in this pic below. And the wine was dangerously drinkable. It didn’t stand a chance with me and my sister on Wedneday Wine and Cheese night. Before we knew it, the bottle was giving us its last drop of heaven. 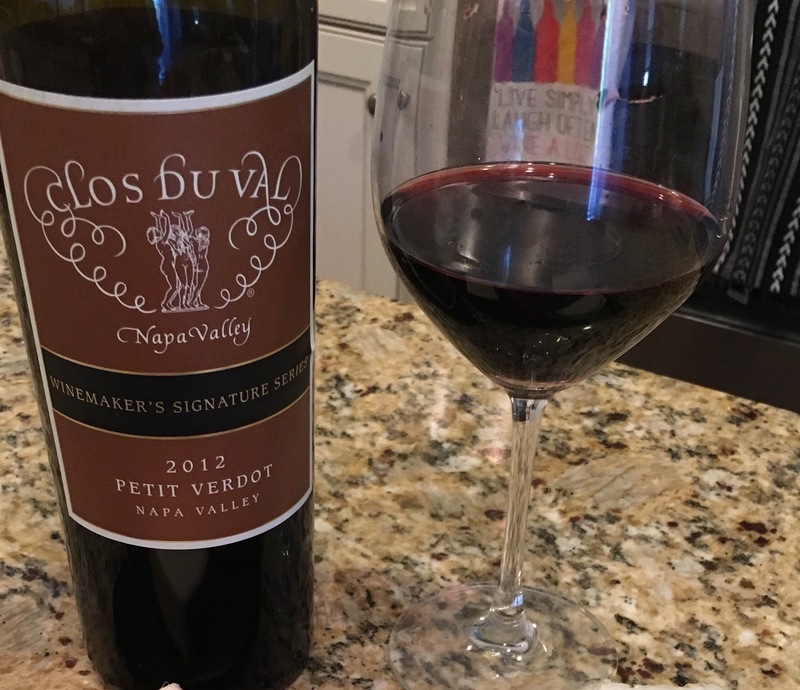 Clos du Val’s 2012 Petit Verdot. I feel like I’ve mentioned this one before. Anyways, it’s worth repeating. I can’t say how palate pleasing this rich, soft, luscious red varietal is and how easy it goes down. I can’t help but feel like I’m in Napa when I drink this one. I nearly shed a tear when we had tapped the bottle. I hope I have another one in the rack, but as I sit here on the train this morning, I’m just not sure!! I love how you made an elegant spread sound so easy to do – I see its all about the right ingredients. Love your cheese board ! Thanks GoGirl – can’t wait to see where you go next!